This was taken at Paul Partain's house after an evening of dinning out on Paul's back porch. Paul & Gunnar later signed a few of my TCM related materials. 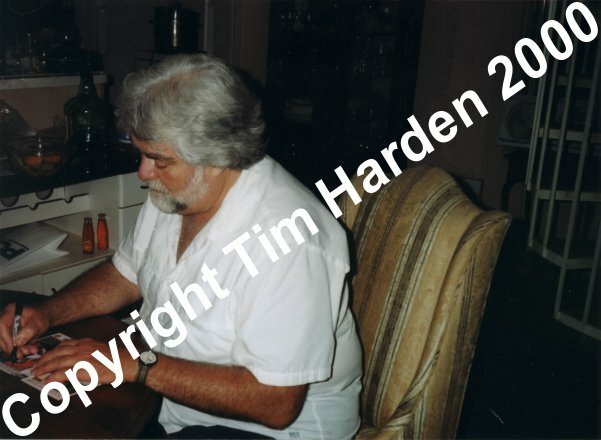 This is Gunnar Hansen signing my copy of the Exploited Video documentary, "Texas Chainsaw Massacre - The Shocking Truth". I have put the copyright information on this picture because I'm currently auctioning off the video and this picture is one of a few that I am using as proof of authenticity. You can view my eBay auction for this video HERE.